Tooey has been gone for two days. Last Monday evening, while Cooper and I were at Obedience class, Russ took Tooey to meet Stacy, who graciously ferried Tooey up to Colleen’s Spa for Hot Girls. Ever since then, Cooper has been searching for Tooey. On our walks, he pulls us along the path she last took. In the house, he looks in her crate and lies on her bed. Sometimes, he eagerly trots to the front door, ear perked forward, waiting. He waits, and then his ears fall flat, and then he’ll turn around and go back to his earlier spot on the floor. She is his. And for the last several weeks, she’s been getting ready for him. And now she’s gone. And so Cooper takes solace where he can, here with the shirt Russ wears when they wrestle. Cooper and I need help with the Long Sit and Long Down. Last Saturday at the Obedience trail in Albany, Oregon, Cooper would have (barely) qualified if he had just stayed down. But at 2:40 in the Long Down, he got up and walked calmly to me. He’s done this at his last 4 trials. Which is why I did not go back to try it again on Sunday — I didn’t want to give him a chance to practice getting up again. Something is happening at shows. I think it’s partly his nerves. Possibly something with my nerves. And the fact that he’s gotten up at almost the exact same time in each of the 4 trials tells me he has a show clock in his head. Maybe it’s history that set that clock. At his second trial last August (in which he did qualify), another dog got up, went over to Cooper, and sniffed him. The dog was friendly and non-confrontational, but this was unexpected. And good-boy Cooper stayed down. But then the handler ran up to both dogs, gesturing wildly and talking loudly at her dog. That did it, and Cooper got up. Fortunately for that trial, the judge decided the interference was unfair, and gave Cooper an opportunity to do the long down again, with just him and me in the ring. But unfortunately for the long run, in every trial since then, Cooper has gotten up early. I’m not sure what to do. We will keep working on his attention to me and on my handling errors, but that’s not going to solve this particular problem. And this is the problem that is stopping us from qualifying. …Any time you start to feel nervous, take a nice deep breath and picture three images in your head. First think about the first time you ever saw your dog. Next think of something your dog does that makes you feel proud. Lastly think of something your dog does that makes you laugh. Practice it now. I bet when you finish you will end up with a great big smile on your face. I am inspired. I’ve starting sorting through my mental list of Cooper images. Most of them are just in memory, but others are actual photographs. I first saw Cooper at Tammy’s parents’ house. I had met Tammy only a couple of times before, but she had taken the trouble to fly out from Minnesota with my Cooper, her Mowgli, and Amy’s Maggie. 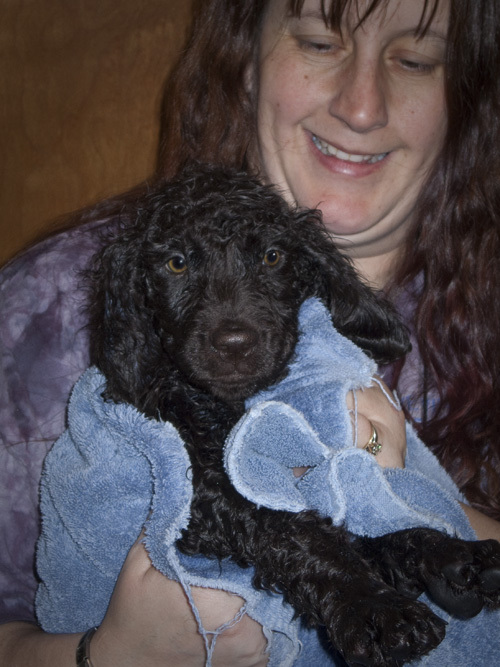 When Russ and I arrived, Tammy’s mother directed us into the laundry room, where Tammy was giving a very wiggly 8-week-old Cooper a bath. Cooper’s hunting and retrieving skills and his intense enthusiasm for the work makes me proud every time we go out to hunt or train. 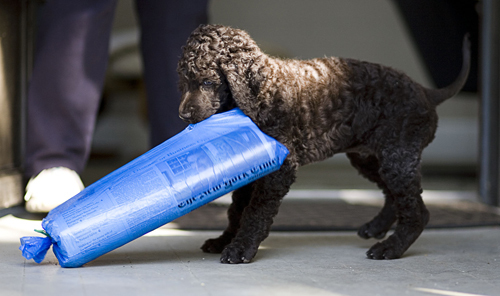 He found the thing he loves in life very early, when at 9 weeks he first retrieved our morning paper. Since then, Cooper has pursued field work with the kind of passion that makes me snort when I hear people say, “My passion is…” or “I am passionate about…” They (and I) would be very lucky if they felt 1/10th the passion Cooper exhibits when he’s hunting. The illustrative event that sticks in my mind is Cooper’s 2nd AKC Junior Hunt Test. This was a very hard test: Only 31 dogs passed of the 56 entered. The retrieves were long, the marks were launched against a dark backdrop of trees, and the many shadows, dips, shallows, and tall cover made the test difficult. 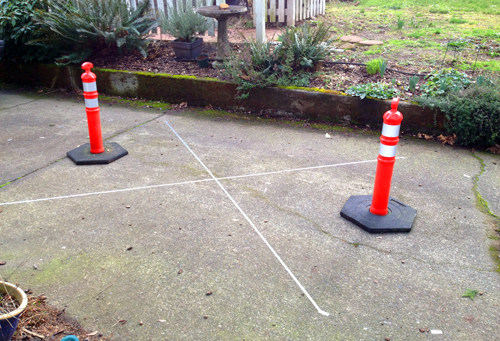 (Not to mention the pink flamingo line markers.) But Cooper succeeded and brought back all 4 of his birds. In fact, in all the hunt tests he’s ever entered, even the ones he’s failed, he has never failed to bring back his birds. And in all the hunting we’ve done, he’s brought back all his birds except for three: two of these were not found even though multiple dogs and multiple people looked for them, and the other was finally located by another dog after two long searches. Cooper has a multipurpose relationship with his toys that makes me laugh every time. One is that he uses his toys to express his understanding of value and fairness: He trades a toy for something he wants that is not his. We’ll walk into the bedroom and find, instead of two shoes, one shoe and a toy. Or, in the bathroom, we’ll find a toy instead of the washcloth. Another funny toy thing is, we’ll say, “Want to go for a ride in the car?” Tooey will race to the front door, but not Cooper. Cooper runs first to the toy drawer so he can grab a toy to take along for the ride. I wish I had a video of this, but when I’m getting ready to go for a ride with the dogs in the car, my hands are full of leashes, keys, a coat, my purse, a couple of treats, and several plastic bags. When the dogs and handlers look ready, I ask each student to close her eyes, and while keeping her hands on her dog, remember the first time she saw her dog. I’ll give her a minute to take in that memory. Then I ask her to think of something her dog has done that makes her laugh. Lastly, I ask her to think of something her dog has done that made her proud. I love to watch my students, beaming and chuckling and petting their dogs as they’re doing this exercise. I made myself dizzy yesterday afternoon, all in the service of improving my dog obedience handling skills. 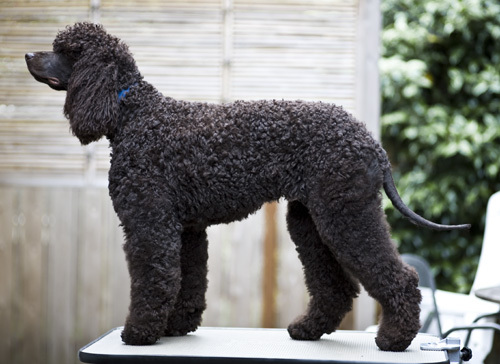 Finally, what my teachers have been trying hard to show me is beginning to sink in: so much of my success (or lack thereof) in competition obedience lies with my footwork. Since you can only minimally talk to your dog in obedience, footwork (and body position) have to do all the work of telling your dog where the two of you are going; where you’re going next; which way you’re going to turn; and when to go, when to stay, and when to stop. All without walking into them or stepping on them. One of the biggest challenges for Cooper and me is the figure 8: two people stand 8 feet apart, and the dog/handler team must walk in a figure 8 pattern around them twice, with the dog staying in heel position. It is much harder than it looks. When the handler goes around to the left, the dog is on the inside and must go slower than the handler to stay in heel position. When the handler goes around to the right, the dog is on the outside and must go faster to keep up with the handler. Cooper has his own things to learn with this, but to help him learn his part, I have to be pretty solid on mine. One issue is that the handler has to be as predictable as possible, not only with which foot you start with, but with the number of steps you take. Every time, you have to take the same number of steps around to the left, the same number of steps around to the right, the same number of steps in between. And to know how many steps you’re going to take, you have to do it over and over. In these two pictures, you can see the duct-tape X. 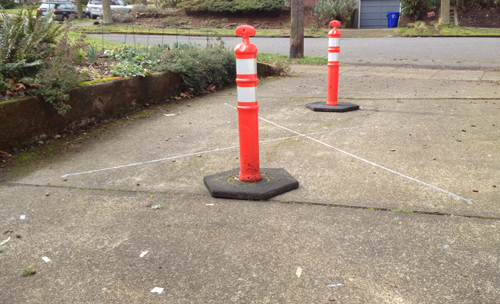 The ends touch a 3.5′ radius half-circle on each end, marked by short pieces of more duct tape (which are harder to see). I spent quite awhile out there, walking the pattern over and over. So far it’s looking like 5 steps along the straight, five steps going around to the left, and 7 steps going around to the right. Then I tried it out with Tooey. She’s always been much more interested in staying up with me, so I got a good sense that a 3.5′ radius half circle will work pretty well with her. As long as the post people are as skinny as a the safety post, that is. Getting into the Irish Water Spaniels as a breed has brought many changes and additions into our lives (as chronicled in this blog), but one of the best things is the amazing people we have met who have become fast friends. One I would like to highlight is Carol. 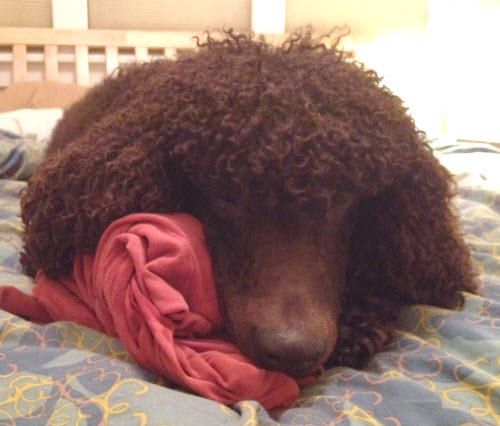 We have posted numerous times in this blog about one of her dogs, Scarlett, a Boykin Spaniel she co-owns with her husband Norm. While Carol does not actively run Spaniels in hunt tests, she has been an active member, officer, and board director of the Lower Columbia Hunting Retriever Club. A number of the photos I have posted of upland hunting with Norm and Scarlett have been taken by Carol. She does run a Tibetan Terrier in AKC Agility trials and drives horses in competition, so running dogs in hunt tests would just be an unnecessary burden on her time. But in what limited spare time she has, Carol is an Oregon Master Gardener and artist in many mediums. 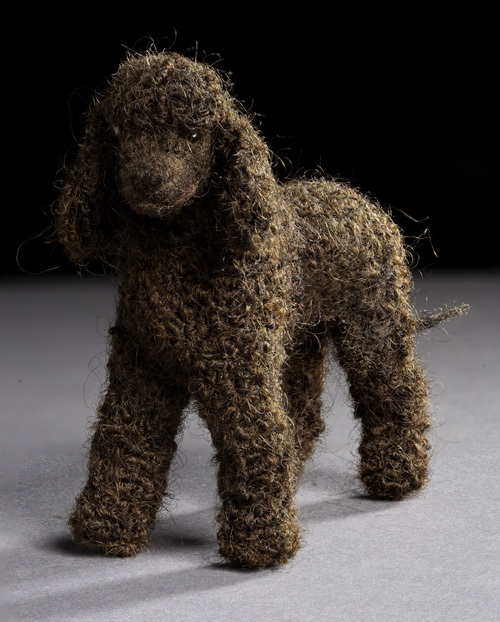 Last summer at a fund raising event, I was high bidder at a silent auction for a custom-made felted dog sculpture made by Carol. 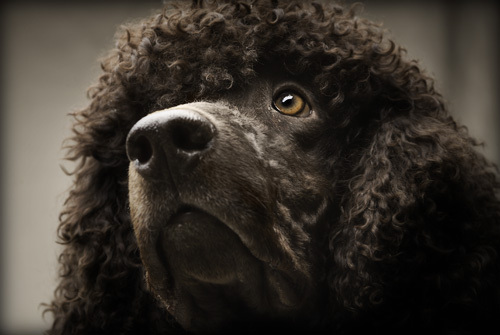 I got to choose my breed, and of course I went with an Irish Water Spaniel. Most of the other bidders were Labrador Retriever owners, so Carol was probably expecting a simple project with a smooth coat and maybe a color choice between Black, Chocolate, or Yellow (you know all those Labs look alike). Undaunted by my request, she asked for reference photos, even though she is familiar with the IWS breed and is friends with Cooper and Tooey. We even supplied a bag of clipped Cooper coat for the basis of the felted creature. What Carol produced was the ultimate Mini Cooper. 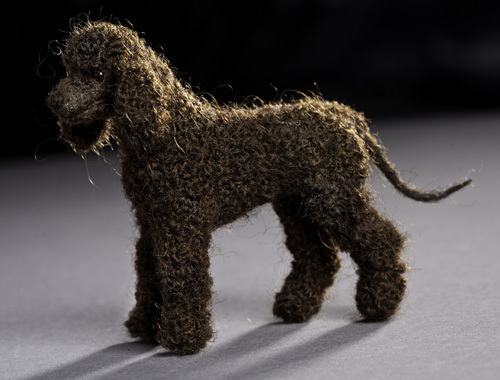 Not only is this a three-inch version of an Irish Water Spaniel, but for those who know Cooper, you will recognize the specific inspiration for this rendition. Compare the felt sculpture to the photo below that I supplied Carol as a reference. 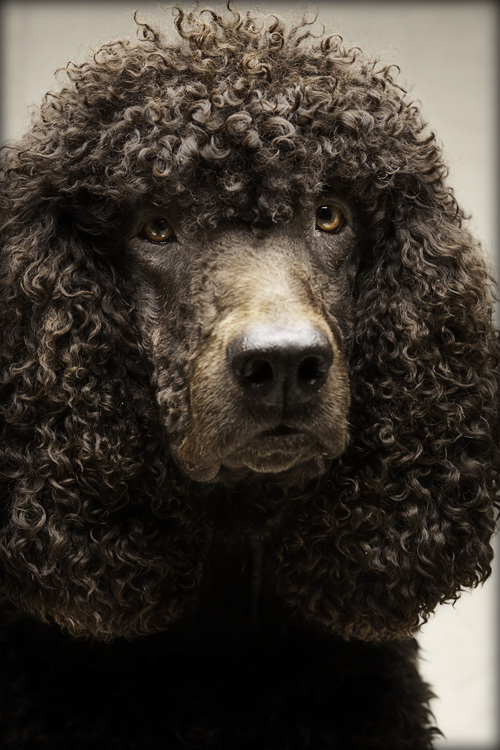 In her drive for detailed perfection, Carol needed to find some hair that would curl correctly at that size and look appropriate for a miniature Irish Water Spaniel with tight curls. Her research found some wool from a breed of sheep named Coopworth (really, we did not make up this name). She twisted several strands at time and then inserted them into the body, . . . hundreds of times. Carol even included Cooper’s extra facial hair curls because she knows we like them, even though they are generally kept trimmed for the confirmation ring. To put this small creation in scale with the real thing, I asked Tooey to take a look at this masterpiece while I made this photo. The last 5 years have been delightful, frustrating at times, but very much life-expanding. We have totally changed how we spend our time and money, and we have added so many amazing people to our circle of friends. All due to Cooper joining our household. 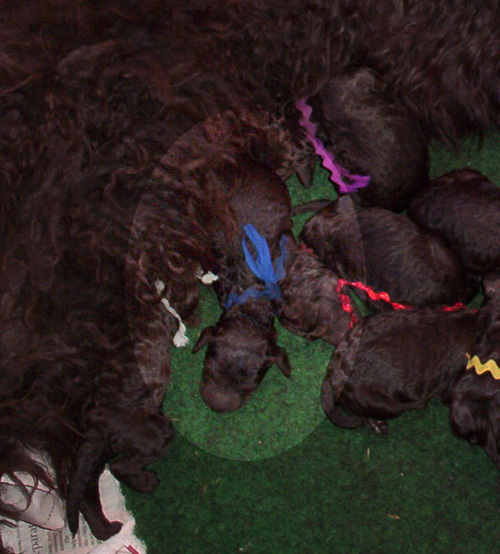 On Valentine’s Day in 2007, Cooper (then known as Blue Boy), along with his litter-mates, started life in Minnesota. 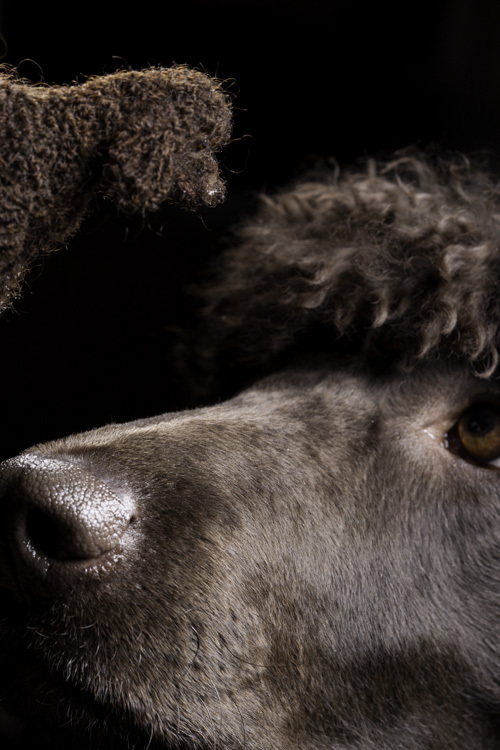 Now as a (mostly) mature male, he still thrives as a vibrant Irish Water Spaniel retrieving, hunting, and living the good life the Pacific Northwest. 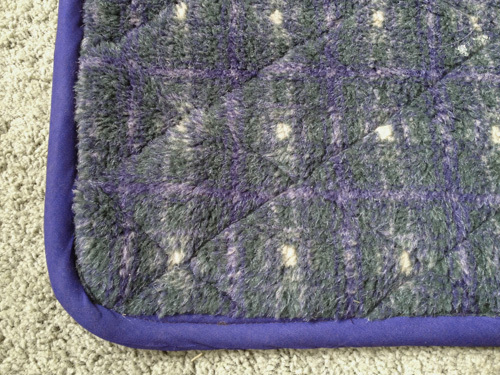 About 16 months ago, I attempted to recreate a dog mat that I had bought at a dog show. I loved the original, and I would happily have bought another one. But I have never been able to find the vendor who sold it to me. But I still liked the original better: It’s quilted, but not too thick, with fleece on one side, denim on the other side, and some sort of thin batting in the middle. The one I bought is sturdier than the one I made — even when chased and tumbled over, the bought one doesn’t all rumple up and fold over itself. So I tried it again, this time with new materials: denim on one side, fleece on the other side, a medium weight batting (the sewing store clerk told me it would mat down after awhile), and best of all, this iron-on glue-tissue stuff that kept all the layers from sliding around as I sewed them together. 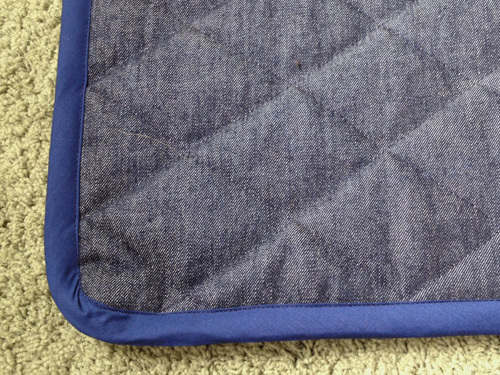 This dog mat turned out much better than my first attempt. It’s heavier like the original, and doesn’t fold up over itself even under dog wrestling. 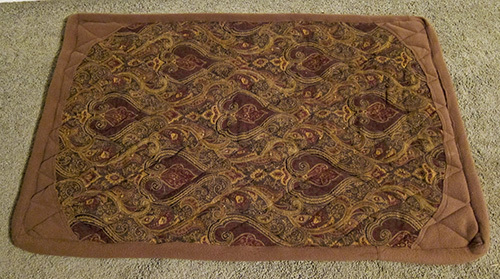 The glue-tissue stuff really worked to keep the layers together, so it didn’t bunch up while I was sewing it. I did need help — the thicker and heavier layers and maneuvering them through my non-quilting sewing machine needed another set of hands, which Russ was happy to provide. In my last post about labor of love AND economy, it turned out that my homemade efforts were less expensive than the store-bought. But in this case, alas, that’s not true. I bought the original mat for about $25. This homemade one cost about that just in materials, even after the 30% sale discount. Perhaps if I had gone to a 2nds store or ordered online, I might have found less expensive materials. Or if I had a wholesale account somewhere. But then add on the 12 hours it took to make this mat, well, that pushes it way over the top, even if I were paying myself just minimum wage. But regardless, Cooper seems to like it. He eats his dinner on it, lies on it once in awhile, goes to it when told “go to your rug,” brings the stolen underwear and hand towels to it, and even regurgitates on it from time to time.